Shopfitting work is underway inside the shop on Mill Road which is due to open as a Tesco store on Saturday the 26th of August. Tesco is proposing to open their new store on Mill Road, Cambridge, on the 26th of August 2009. 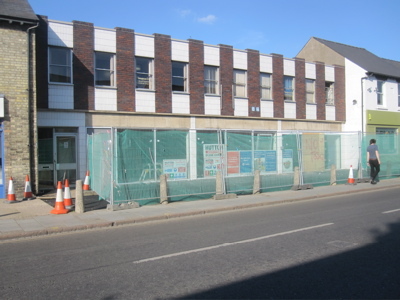 The store is to be smaller than Tesco wanted as their application to extend the building was rejected by both city councillors and, when Tesco appealed, a planning inspector. Whether or not the store will be permitted to sell sell alcohol will be determined by a committee of three city councillors sitting on the 17th of August 2009. Another regulatory hurdle being faced by the store arises from the city council apparently considering applying to a court for an injunction to ensure Tesco comply with a planning condition which states: “No loading or unloading of goods, including fuel, shall take place otherwise than within the curtilage of the site”. ie delivery vehicles ought drive into the service yard at the back of the shop and not unload while parked on Mill Road in front of the shop. On both counts I think it is very important that Tesco is not given any special treatment, I have no ideological views for or against Tesco, I think they ought be treated as any other company would. I am not sure if, as has been reported, Tesco have actually made clear their intention to ignore the planning conditions and make deliveries from the street, but if they have then I fully support those campaigning for an injunction. Having a pre-emptive injunction in-place will enable Tesco to be taken to court very rapidly if they breach it, whereas other methods of enforcing planning conditions can be very slow. I hope that Tesco will show respect for the due processes followed both relating to planning and licensing and will not take the approach of seeing fines or other penalties as merely costs of doing business. This representation relates to all four licensing objectives. The police believe that the grant of a premises license in this case would be contrary to the requirement for the licensing authority to carry out its functions with a view to promoting the licensing objectives, namely: the prevention of crime and disorder, the maintenance of public safety, the prevention of public nuisance and the protection of children from harm. The belief is based in part upon existing statistical analysis of evidence of incidents of criminal and anti-social behaviour, nuisance and disorder in and around the vicinity of the subject premise [sic], which are located within an area identified by the authority as one where the cumulative impact of the grant of additional premises licences would be such that there would be an increase in such undesirable activities regardless of the manner in which the premises are operated. Evidence adduced in support of such representations may comprise the first hand knowledge of officers involved, as well as police records from the Command and control logs, police crime files and/or CCTV footage. I made a freedom of information request for the application and the police representation via the website WhatDoTheyKnow.com; if the council had complied with, rather than rejected, my request the documents would now be available online for public viewing. When I looked at the papers in the guildhall the appendix which was supposed to contain representations from local residents and others was missing. The officer’s report states that one hundred and twenty three representations and a thirty six name petition were submitted. I hope that the councillors considering the application have read the representations – too often when I’ve seen them considering planning applications councillors have not visited the councils offices to read all the papers in advance of the meeting. If the council conducted more of its business electronically then providing detailed information to councilors and the public would be made easier. 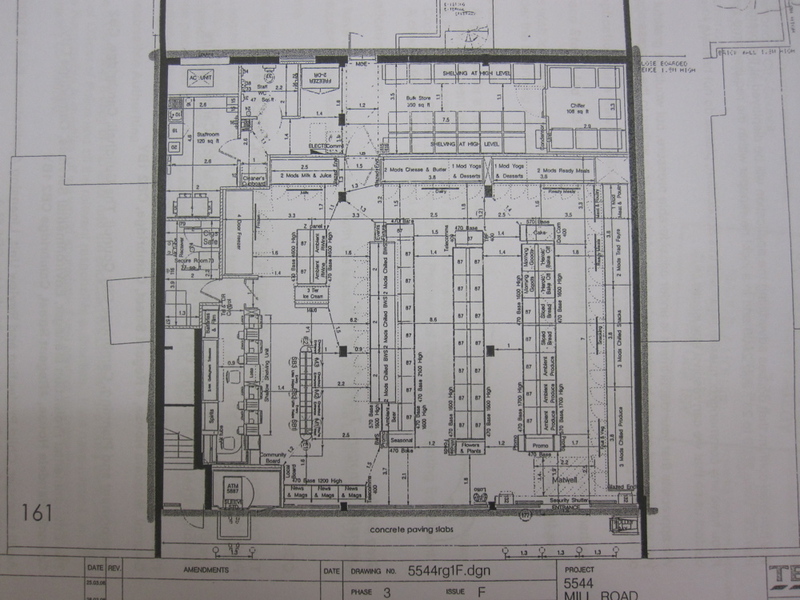 The licensing application contained a plan of the new store, showing where the various types of products would be located. It appears almost identical in layout to the Campkin Road store, with slightly more space around the checkouts. The Cambridge Cycling Campaign are lobbying the council, asking them to enforce the planning condition relating to loading. Vehicles parked on the road while unloading make the road more dangerous and unpleasant for cyclists. Tesco’s covering letter accompanying their license application and the key pages from the police representation. A PDF document I created following my visit to the council to view the documents. This entry was tagged Cambridge, Cycling, Mill Road, Planning, Tesco on August 12, 2009 by Richard Taylor. For reference, the licencing panel which will hear the application did not need to visit the guildhall, it received a copy of all the objections. These won’t be in the bundle you saw, as they contained confidential information due to the Data Protection Act. Tesco stated “deliveries: via entrance” in their alcohol application, so it is clear they plan to deliver from the front, otherwise they would use the loading bay at the back (which their lorries could barely access). Today deliveries to the front of the proposed Tesco store in Mill Road blocked the road for a considerable period of time causing a very dangerous situation. Breaches of planning in terms of delivery have happened at the site almost daily since contractors began work. We call upon the council to enforce it’s own planning rules immediately. Will Tesco be allowed to sell alcohol in Mill Road even if a licence is refused? Thanks for the assurance that the representations have been sent to the councillors on the licensing committee. As to them not being available to the public due to Data Protection considerations; I can’t believe that’s right. I suspect they were just too voluminous for a copy to be held at the reception desk at the Guildhall. With respect to planning applications I have been given folders of objections, including any addresses, email addresses, phone numbers etc. that people have submitted with them. I think its right that when people are asked for their views that there ought be access to representations made by others; this enables people’s responses to build on each others, and enables arguments raised to be countered by others. Thanks for that, while I didn’t see anything in the licence application myself clearly stating the intention to deliver from the front – the quote in the Cambridge-News is very clear and ought in my view be sufficient to gain an injunction. My flatmate stood at the bus syop on the Broadway for some 25 minutes on Wednesday 12 August (9.25 am to 9.45 am) and watched a delivery taking place to the Tesco site. A wagon was parked on the street whilst a piece of bulky equipment was being unloaded. Although large, the wagon was smaller than the usual Tesco mobile warehouse. Cyclists and pedestrians struggled to get past (although the fence contributed to that) and the traffic became something of a nightmare (for part of the time there was also a vehicle parked on the opposite side of the road a little further down. Not only was traffic reduced to single lane, the buses and larger vehicles struggled to manage that at times. Tesco suggest they will be doing this at least twice a day, despite knowing they will be in breach of the planning condition. It seems Tesco are not prepared to admit bought the wrong site and go away – presumably losing one battle may encourage more people to stand up to their bullying tactics. Apparently they may also be looking to open a store on East Road, where deliveries will take place across the Adam and Eve Car Park, another traffic nightmare waiting to happen. They have outline permission there, probably because the Tesco name wasn’t mentioned in the application. contains plenty of evidence of what is going on! Several area councillors also have the email from Tesco’s spokeswoman to Raymond Brown at the CEN confirming the intention to make deliveries to the front, which I would have thought is a clearer indication of intention to breach than having to rely on this being conveyed second hand in the CEN. I know this because I sent it to them about three weeks ago. Thanks I didn’t spot that when I had a quick look through the application at the guildhall, and my photograph of the plan itsself doesn’t include it – I didn’t include the footer. That the council have an email from Tesco confirming their intention sounds to me like plenty to get an injunction on the back of – that sounds like very strong evidence to me. Yes, I would certainly have thought it is very strong evidence. In addition, the fact that Tesco’s contractors have now bricked up half of the double doors at the back, thus making it impossible to move delivery cages through the back, is very strong circumstantial evidence. We have now been told that Councillors have called for a special meeting of the East Area Committee next week to discuss – and hopefully approve – an application by the Council for an injunction. It seems that officers were reluctant to commit the Council to such expense (presumably including the risk of having to meet the costs of Tesco’s legal team) without clear endorsement and instruction by elected members. Has anyone yet seen details of when that meeting may be? David, I linked to Cllr Howell’s call for a special East Area Committee from my article. It might be worth trying to get a public question at the main planning committee on Wednesday – on the grounds if the council is prepared to enforce planning conditions or not is an important question affecting the city as a whole. The chair may well not allow a public speaker unrelated to a specific application though. Cllr Howell is reporting that his request for a special meeting of the East Area committee has been accepted and a meeting scheduled for Thursday 20 August at 10.00am at St Phillips Church on Mill Road. The council’s meeting list is not currently showing this meeting. It is good news to hear that there is going to be a meeting. However, the timing is not great considering that, contrary to many Tesco supporters, the majority of anti-Tesco on Mill Road campaigners have got something better to do with their time, i.e. going to work. As a self-employed person it may be that I will be able to re-arrange my commitments for the week so that I can attend on behalf of Cambridge Friends of the Earth. Has the meeting been announced elsewhere to the public please? I found out about it via Karl Hartland’s comment on Facebook, just by chance. It would be really good if we could get everybody who is available to attend to once more show the Council how strongly we feel about this issue and their responsibility to us? We’ll send the details to our active members. City Council licensing committee just rejected Tesco’s application. Update: Full article now available via this link. Either side can appeal if they bring up new evidence or find a flaw with the process. The process looks to have been fine. An appeal may be lodged as soon as this afternoon though, and then the decision of the three councillors will be reviewed by a whole new hearing in-front of three magistrates (or a district judge). Chris Howell did not call for the special meeting of East Area, Cllr Smart with the support of Cllr Wright, Cllr Ellis-Miller and Cllr Howell called it but as I know it Cllr Smart was instrumental in setting it up. Councillors are to discuss the main body of the meeting’s business in secret session. I have lobbied suggesting that they debate, and take a vote on, going into secret session. This might at least delay throwing everyone out and allow some of the councillor’s views to be heard in public; and for some information on the council’s position to be shared. I passed the site this morning and noticed a large Travis Perkins Lorry – possibly filled with tar at 8:10. In the middle of rush hour it did cause quite an obstruction. I also noticed some workers marking up the road further up and am now wondering if the council are going to be resurfacing this side of Mill Road and if so will it ‘clash’ with the opening of Tesco…. According to Cllr Howell’s website Tesco have given an assurance not to deliver from Mill Road when their new store opens. He reports that they have written to the council’s planning department, confirming they intend to deliver from within the site ie. drive their lorries into the service yard. That is fantastic; and only leaves the question of how their lorries are going to safely reach the service yard. I am far from reassured about this “intention”. The whole area has bollards to prevent large vehicle access from Coldhams Lane and also to restrict internal movements. Movements between the side streets from Mill Road is deliberately obstructed by bollards to keep lorries out of the narrow residential streets in the area. Tesco should not try to do this. This site is by design simply unsuitable for their intended use. They are stupid and/or arrogant in trying to do so.